"I was only dimly aware that you could knit a doily in the first place." I kid because I love. This week as I browsed the rules book (called a Premium Book) for my local county fair's hand-knit section, I despaired. The rules-makers have seen fit to toss all manner of desirable items into the same bucket, which means that hats, gloves, mittens, shawls, scarves, and anything else deemed an "accessory" are all competing against one another. Norwegian stranded mittens versus Estonian lace shawls. Colorwork tams versus laceweight cabled gloves. What a nightmare. Obviously the winning strategy is to pick a category that few other knitters will be submitting works for. Level the playing field. I browsed the other categories and my eye fell on "Doilies." I was only dimly aware that you could knit a doily in the first place. As I pondered it, I churned up vague recollections of reading some blog posts by Franklin Habit, in which he was slowly being driven insane by the knitted doily patterns by Herbert Niebling. Let's get one thing out of the way up front: No one needs a doily. A hand-knit doily may well be the most useless thing you could possibly knit. At least a tea cozy has an actual function, even if you rarely use it for such. But a doily serves no function that a coaster can't perform better. In other words, if you knit a doily, you're only doing it to knit a doily. It's the most self-referential form of knitting possible, in this day and age, short of actually knitting up your own yarn. Most doilies are knit on size 0 or 1 needles. That doesn't sound too bad, does it? But what you use is thread. Literally thread. Ideally cotton thread. You can cheat and use laceweight yarn if you like, but the lighter the better. 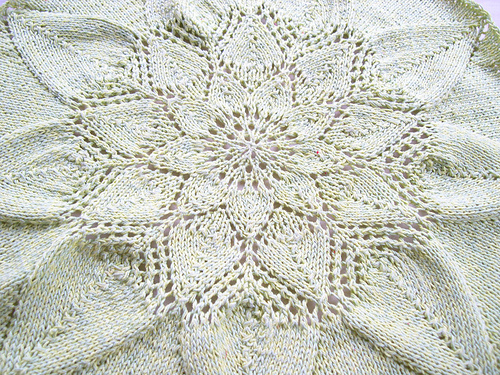 Although most doilies are intricate, the patterns of the aforementioned Herbert Niebling are considered the pinnacle of the art of lace knitting. His pattern "Lyra" is as breathtaking as it is legendary.